Edited by: Timothy George, James Earl Massey, Robert Smith, Jr.
Resources for preachers steadily appear, called forth by the perennial need on the part of working pastors for helpful and inspirational materials backed by tested experience, reverent scholarship, and creative insights. The essays in this book are of that cast, and each essay is the work of an experienced practitioner-scholar in the field of preaching. 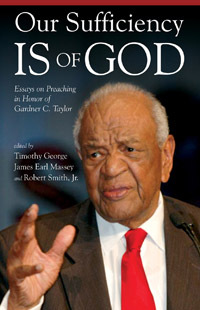 The chapters focus on the preaching ministry of Gardner Calvin Taylor, in whose honor the volume was prepared. They are offered, with affection and esteem, by colleagues, students, and friends, fellow preachers all, whose own attempts to speak the unsearchable riches of Christ owe much to the life and labors of Gardner C. Taylor. Considered by many as the greatest living American preacher, Gardner C. Taylor has often reminded other preachers about the need for divine help in fulfilling the call: “All in all, a summons to the ministry is no light calling. The work of communicating the gospel requires us to be more than we are—to exceed who we are.” This volume will lead readers to the realization of the need for grace and a sufficiency only found in God (2 Cor 3:5 KJV) as indicated by the title.